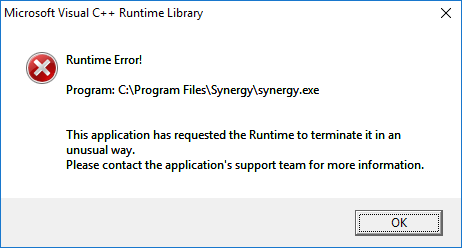 I get the error with Synergy versions 1.8.4, 1.8.7 and 1.8.8. Has anybody else encountered this problem? Is there a known solution? Have you tried rebooting your machine already? Can you try uninstalling it then reboot machine. Re-install after the reboot. I did, but I still get the same error message. 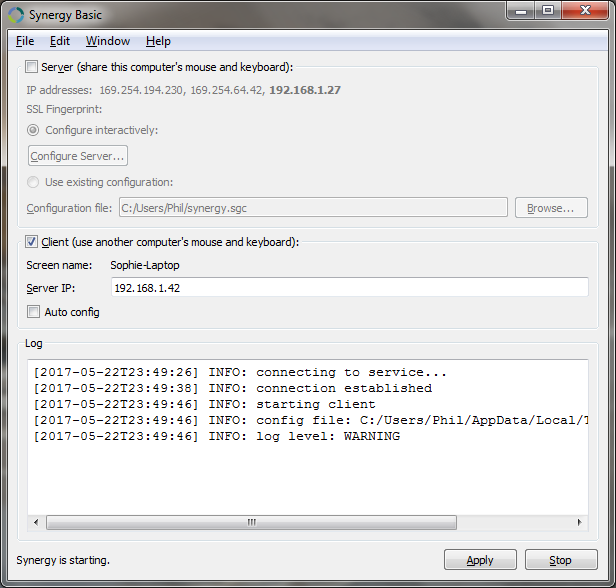 Can you try v1.9.0 from this Synergy v1.9.0 Release Candidate thread? The error does not occur anymore, but the main window takes about 40 seconds to appear. The client does not connect to the server (Connection was refused). Set it up following Getting started with Synergy. I followed the instructions with no success. 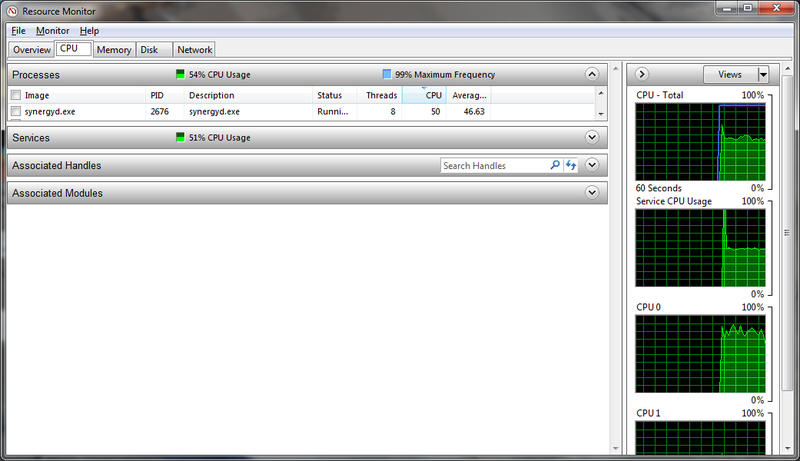 I installed 1.9.0 on the client (Win7 64bit) as well, but it has 50% CPU usage, so that won't work for me. Can you post a screenshot of both machine's Synergy interface? So it successfully connected now, right? Can you set the logging level back to Info? This will lessen the CPU usage. Are you familiar with the interface? The clients log level is set to info, but that has no effect on the CPU usasge. 50% CPU usage is an indicator for an error and should not result from a high logging level. Due to the installation of 1.9.0 on the client I now have a new problem. 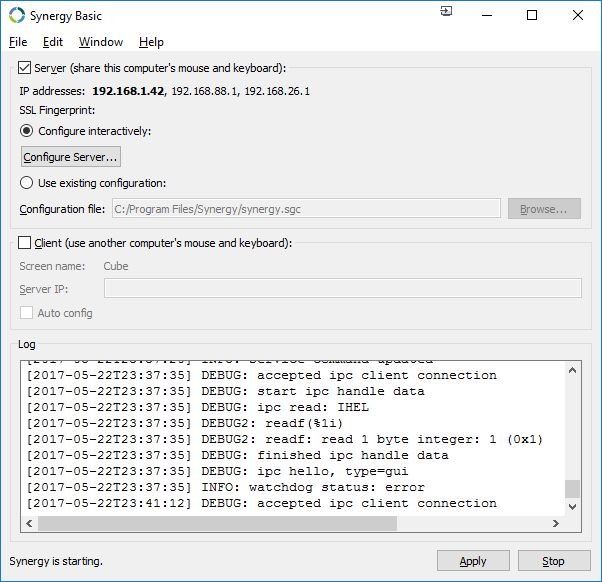 The synergy service can't be stopped and is taking all the CPU time of one processor. I can't even uninstall this version, because the uninstall routine is unable to stop the service and fails. Have you disconnected before uninstalling? The service can NOT be stopped, how should I disconnect? 1.9.0 is running with long delays on the Win 10 server. 1.8.8 is running on the Win 7 client. Can you try pinging the client machine from the server machine (and vice versa) ? Synergy has worked in the exact same setup for years, only since I updated to 1.8.8 the problem arose.